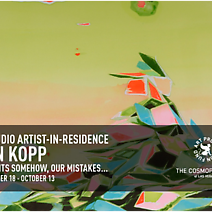 Dan Kopp is a visual artist who lives and works in Brooklyn, New York. He has exhibited widely at galleries, museums and art spaces in the U.S. and internationally. His work was included in Greater New York 2005 at MoMA’s P.S.1 Contemporary Art Center and he has had solo exhibitions at CTRL Gallery, Houston, Motus Fort, Tokyo, Shoshana Wayne Gallery, LA, Bravin Lee Programs, NYC and BucketRider Gallery, Chicago. Dan studied painting at the Cleveland Art Institute, the Lacoste School of Art in Lacoste, France and at the Skowhegan School for Painting and Sculpture.